Today we left the land of Ole and Clarence -- we really enjoyed seeing this part of the country, and the people are amongst the friendliest we've met. 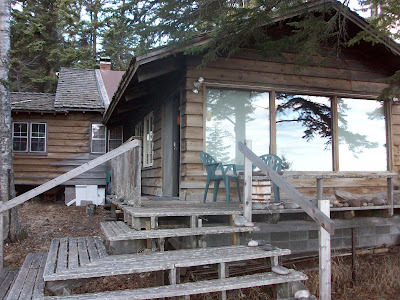 I'm going to miss that old fishing cabin! Scott skied well today. The first course set was nuts and impacted all of the field except two USST racers who nailed it. Scott's description was that it was so non-rhythmic that he had to "think" all the way through and never got in the flow. Notwithstanding, he was 11th after the first pass. He burned the second run, moving into 6th place overall. So for the weekend he earned two Golds, two Silvers and the Combined for J2s. He also, curiously, finished third for the season in Central Region, to which he doesn't belong. I imagine the J2s will be glad to see him leave. We saw some crazy course sets this week. In addition to straight courses and way offset courses, we saw the following: oblique inside hairpins, hairpins running straight into hairpins, delays into hairpins, hairpins into delays, a hairpin into an inside flush which was oblique, and for the first time ever, a delay into an opposite delay (thus creating a semi-GS section). I guess the FIS requirement for three hairpins, one flush and one delay just isn't enough for some people! Some coaches feel they need to get creative. They pride themselves on artistry, even when it degrades the competition. Some of them even think they're Picasso... I do not subscribe to those theories. I believe a course should be straight-forward, rhythmic and challenging. Not easy, just fair. The best racer will always win, but fair courses allow all the athletes to measure themselves against the best. A rule of thumb is that if a course knocks out more than 20% of the field (barring extreme snow conditions), it's the course setter's fault. Since Scott advanced to the FIS level, I've frequently seen 40% of the field DQ in a run. Another disappointing trend is that this often happens on the final day of an event. I've heard coaches joking about "Sunday sets" that allow them to hit the road home early. That's criminal! Each of these athletes has worked years preparing to compete at this level. They deserve a fair shot. Moreover, each of their families spend about $1000-1500 per event for entries, lodging, meals and travel. I don't think we have the right to be so cavalier about their investments. The US Ski Team publishes objective criteria for team selection each year. This year's criteria were tightened-up from years past. For a J2 to make the team, he must win two of four events at the J2 National Championships (Scott won two and took Bronze in another), be ranked top 10 in the World for his age group in one discipline (Scott's #1 in the World in two disciplines), and have Giant Slalom or Slalom points below 45 (Scott was at 48 and 46 respectively when he woke up this morning). We haven't discussed this as Scott inched his way down the past few weeks. But every crash or missed opportunity turned up the pressure... silently. Today Scott brought his Slalom points down to 41, thus fully meeting US Ski Team criteria. Of course, nothing is official. The invitation letters go out in May. However, for the time being he's the only non-team member to meet criteria this year, so we sort of expect the letter. This is a big relief for both of us, although we never doubted his ability. Now that it's done he can relax and enjoy the remainder of the season even more. A good, semi-emotional night for the Snows. 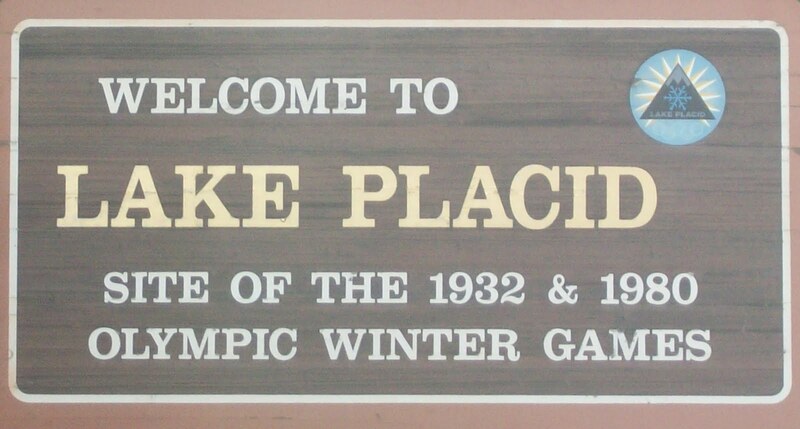 We rented a lakeside cabin near Lutsen, Minnesota for the races. Little did we know it would be an artifact. This place is great! It was built by the owner's grandad, and he hasn't changed a thing. Hand made furniture and cabinets, generations of "special" stones and driftwood on shelves and the porch, faded children's drawings on the wall, old books, hand carvings, wood stove, etc, etc. It even smells old, like my uncle's farm in New York. Scott is loving the place. He thinks it's cool to see the old pots, plates, hand mixers, etc in the kitchen. And he enjoys jumping the rocks along the shoreline. Who cares about racing -- this is a vacation. But sadly, we did come to race. Lutsen is famous for it's Spring championship race -- the Central US FIS Championships. The US Ski Team sent a healthy contingent here (6 or 7) to help with the point penalty and there's plenty of other competition, including numerous college racers. Due to an early thaw, the Giant Slaloms were cancelled, so it's now a four Slalom series. After two weeks of temperatures in the 50's, we had a deep freeze for race day. Be careful what you wish for, they always say. The snow set up like a shiny brick -- so hard I could barely navigate for course inspections. The conditions took a toll on the less experienced skiers. Scott, however, skied well the first two days. He finished 12th and 10th respectively, right in the middle of the USST and NCAA guys. He scored some points, although not as many as he'd hoped. The first day he "... gave the hill too much respect..." the first run. The second run he inadvertently tripped the wand as he approached the start, easily losing a second. Arrgh! But when you're skiing well none of that matters. Tomorrow's another day. Oh by the way, another beauty of our little cabin is that there's no cell service, WiFi or TV. Scott skied great. He attacked the course and even had the fastest split in one run. On the first run he hooked his arm in a panel near on the final pitch, which spun him off line. Notwithstanding, he climbed up 28 places. The second run he was flying again when he crashed in nearly the same part of the hill. He skidded and regained the course after some skating to finish 36th overall. Not a bad showing with a fall, which attests to his speed on top. In all he felt good about the day. This is a tough sport, and as I said in an earlier blog, one must seize the small victories or be consumed. 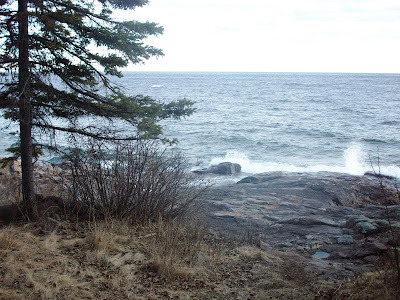 We packed-up the following morning and embarked on two, 12 hour, days of driving to the Northern edge of Lake Superior. We travelled ground we've never seen, including Ontario, the Michigan penninsula, Wisconsin and Minnesota. There's a lot of wilderness left up here... it isn't all Detroit! Scott started 75th in a very strong slalom field today. I figured it would be tough given his start number and the snow conditions. The temperatures dropped to 27 degrees, and they heavily salted the course, but ruts still developed very quickly. They were the ugly, knee deep with verticle walls, variety. The course set was difficult and six of the top fifteen racers didn't finish. By racer number 30 finish times were coming in 4 seconds off the lead. By number 50 times were 7-9 seconds off the pace. Scott skied really well until about 15 gates from the finish, on the final pitch, when a rut spit him out and he did a full flip and a half, landing hard on his right shoulder. Naturally he hiked and finished, but he was dead last by a large margin. At the end of the day, only about half of the field finished. So we decided not to do the second run, and instead let Scott heal for Giant Slalom tomorrow. The temps are supposed to drop into the teens tonight, so we should have a good, icy, surface for his final event. Scott raced in the National Championship Super G yesterday. This is the real championship against the US Ski Team and selected other top US racers, totalling about 80. It was warm and although the track had been heavily salted, it was still a little peely. Scott started hard, then hooked his arm on the second gate, slowing him. In fact, he was 24th on the first split. But he must have put the gas down after that, as he finished 14th overall and 4th for Juniors (age 19 and under). That result raised some eyebrows, as the youngest competitor beat about half the US Team. Scott also had his first major autograph event. The finish area was jammed with spectators. As he exited the finish arena he ran into a herd of kids wanting autographs on hats, helmets, coats, etc. He was signing like crazy and quite overwhelmed when he noticed Tommy Ford (the next racer behind him) come through the gate. "Hey kids, there's Tommy Ford, the Olympian!" The herd immediately shifted it's focus and Scott escaped, only to run into the "second wave" as he described it. After the openning ceremony last night, I decided to check out the Olympic ice arena near our house. This is the scene of the 1980 "Miracle on Ice." As I approached the door I remembered the NCAA Finals Hockey Championship was going on. We strode in as though we belonged there and headed to the upper seating. Zambonies were on the ice and another spectator told me they were preparing for a 20 minute overtime to decide the tied game. So we got to watch the climax of the NCAA Hockey Finals live. Good fun. All in all, it was a very good day! 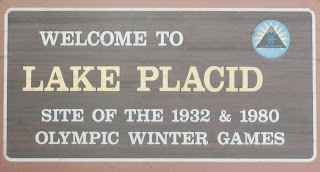 We arrived at Lake Placid around noon today so that Scott could free ski and train a little on the Super G track. The base temperatures reached a record 61 degrees today and the snow conditions on the slopes were abominable. For those who have trained on the Mt Hood glaciers in July, it was like 1pm there. Tomorrow promises to be just as warm. They intend to heavily salt the course, which should yield a pretty hard surface... at least for a while. Scott will be starting 16th, which is an excellent opportunity. The course should still be in great shape when he comes down. Also, the top 30 racers will be shot for the TV coverage on VERSUS March 28th. If he performs well we may be able to see Scott on TV for the first time! If I am reincarnated as a rich boy, I want to go to the Stratton Mountain School. Wow, that place is the best! Last week I called my friend Mike Morin to ask if we could train a few days with his athletes enroute to US Alpine Championships. He said he'd set everything up for us. Did he ever -- room, board, use of the tuning room, lift tickets and three days of much beeded tech training. Ski racers can't just compete. Skills are perishable and they periodically need a "tune-up". Due to the addition of a few events by our Region, Scott hasn't trained since Feb 8th. We didn't want to fall into the same trap as least season, so this stop was just what he needed. But enough about that. Let me talk about the academy. SMS has 120 athletes, divided evenly between alpine, cross country and freestyle. The campus is immaculate and positioned less than 1/2 mile from the slopes. The faculty is top notch. 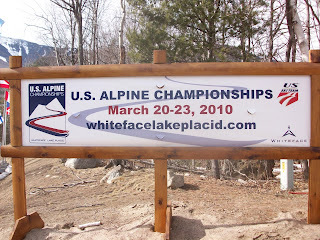 The alpine staff is headed by Mike, a veteran of 9 years coaching the US Team. 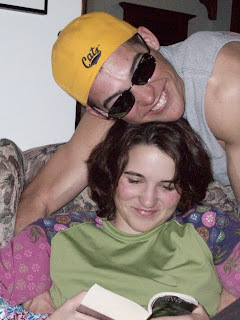 His assistant is a former CU racer who also coached there. The entire staff is young, highly qualified and very motivated. The feeling is similar to when I'd walk into a well led Army unit. We'd call it "Command Climate", and this place has a good one. It also has a first class facility with a large field house, weight room, therapy rooms and staff, etc The complete package. Academies aren't for us, but if they were I suspect this would be our choice. Many sports become "90% mental" at the highest levels. Ski racing is a prime example. On any given day 30 guys could win the World Cup, but the mind is what separates them. Thanks to my daughter and first FIS racer, Bonnie, I've been forced to study sports psychology. Scott is the benficiary. Around age 12 he started to let his mind interfere with performance. Many books, conversations, mental drills and visualizations later Scott emerged with a strong competitor's mind... but he's still 16 years old. Sometimes, for no apparent reason, he goes on some strange tangent. Last week was one of those times. Let me preface this story by saying that coaching ones own son is richly rewarding and highly frustrating. Let's face it, he's 16 and I'm 60 -- I know nothing. But I digress. Last week Scott straddled a gate and had to hike in the first run of the J2 Nationals Slalom race. No big deal, that stuff happens. He decided he'd try to win the second run from the back of the pack in a deeply rutted course. Go for it! So he got all pumped up at the start line and ran an incredible race, knees pumping and arms flying, posting the 10th best time. Now an adult would say that was fun and move on. Not so much for a 16 year old. Two days later Scott made an error in the first run of the Giant Slalom and was sitting in third place, .12 of a second out. The two racers ahead of him hadn't been within a second of Scott all season. All he had to do was settle in for a solid run. Instead he super amped himself. He looked like Ferdinand the bull with steam coming from his nostrils. Scott "overskied" that run and wound up with the Bronze medal. He was reticent to discuss the race and never came to terms with what went wrong. I tried to discuss arrousal levels at the start line, and he shut me out. So be it. A week later we still hadn't come to closure. Today Scott raced in the NORAM finals Super Combined. Because he has no Super Combined points he was starting near last. The snow was soft and the course was a little worked, but nothing serious. At the Super G start line he again got all amped for the race. He looked as he had for the prior week's Giant Slalom. I watched him cut inside the line on the first four gates, very aggreassive, before he went out of sight. When I reached the bottom and saw his time I could tell he'd had a bad run... 3.5 seconds out when he should have been 1.5-2 seconds out against this field. He wouldn't say anything more than, "I skied like crap. I was too hard on my edges." I explained that if that was the best technical analyisis he could offer, he wasn't ever going to improve. He got upset with me and I reciprocated. I told him he might have been a little too fired up at the start. He replied. "It's not a mental issue." We'd forgotten his slalom helmet at the condo, so I went to get it. About 25 minutes later Scott called me. "Hey Dad, you're right. I think you're right. I let my mind get in the way." We agreed that he knows exactly how to fix this and can do that in tomorrow's Super G.
So today was a win. By making a major error, Scott was able to go backwards and identify a problem he can easily control. Any day you learn something is a good day! Travelling as we do, Scott and I see and sleep in a lot of different places. 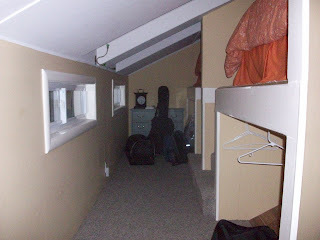 But I have to admit, this week's accomodations take the cake. The photos on VRBO must have used a special, wide angle lense, because when I walked into the place I could have sworn I was in Bilbo Baggins hootch. The place is as advertised. Kitchen, living room and two loft beds. I just didn't realize it was HO scale! But it sort of grows on you and the landlords are very nice, so this'll be fine. The ride to the ski slope is also a treat. Twenty one minutes of muddy lanes over hill and dale. Farms, barns, fields of cattle. Great stuff. So this is home sweet home for a while. Oh, I forgot to add that they have three friendly dogs, so Scott is happy. As we learned by squeezing in the Park City races last month, if you don't build in down time you won't be ready to perform. Some of the athletes on the same circuit as us went straight to training on Tuesday and will train every day until the NORAM Finals begin. Imagine having nine days of competition and training at the biggest event in your season, then going right back into training. Competition, when done at the right level of intensity, is both physically and mentally exhausting. That means a little down time is needed afterwards. Scott hasn't only been resting the past two days, he's been putting last week's results into perspective and refining his plan for this week. The importance of mental and emotional readiness can not be underestimated. We spent two days in the same airport hotel just chilling and eliminating distractions (overdue schoolwork and admin stuff). 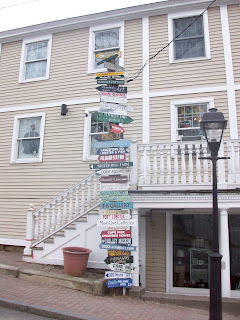 Today we relocated to Kennebunkport and are in an ancient hotel. Scott's off for a run on the beach and I'm going to hike through the historical district. Afterward we'll go eat some fresh seafood (Lobstah skiing!) and maybe take in a movie. Phase two of the downtime. Scott just got "in" the NORAM Finals, compliments of some inside work by our friend and Western Region coach Jeff Pickering. Scott was first alternate. We were hoping for another shot at Super G points before the US Alpine Championships, since Scott missed out on all the speed stuff at Aspen with pneumonia. Jeff said Scott's in for everything, including the GS and Slalom. That would be the temptation... to go for everything and hope for good scores. However we learned last year that success doesn't come without training. Scott hasn't had a chance to practice the tech events since February 8th. Better to be patient and find a place to train. 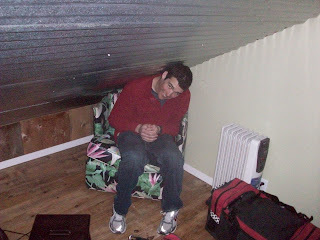 I called my friend Mike Morin (formerr USST tech coach and head of Stratton Mountain Academy). He's arranged lodging, food and lift tickets with his guys for the three days between the NORAM Super Gs and Alpine Champs. Perfect! Very generous of Mike and very good for Scott. Maybe it was the big win yesterday -- the fear that by winning the race that didn't matter he somehow put a hex on himself for the championship. Maybe it was the wind I heard blowing last night -- wind that could steal a victory. Maybe it was the sudden temperature drop that might render the chosen wax ineffective. Maybe it was because I acquiesced and let the head coach change his start number from 8 to 4 (I hate early starts). Who knows what it was, but I awoke at 5AM and couldn't sleep any longer. Extra coffee and computer time never hurts, I suppose. I didn't discuss any of these things with Scott, and went about our race day routine like normal. Good breakfast, equipment check, course inspection, ski preparation, course reports, warm-up, etc. I clicked him into his bindings and skied to my vantage point with a hollow feeling in the pit of my stomach. Then racer #3 (his good friend Max Axlerod) had a bad crash. "Start stop! Start stop!" Damn, maybe this was the curse I'd been fearing. "I hope he keeps his focus. I hope he's keeping his muscles warm. All the things he's been taught." Five minutes, maybe more... Finally the race resumed. Scott skied with great strength and confidence, winning the downhill by another convincing margin of one second. Yahoo! The wait was over and the world was right again. Today Scott completed one of the best weeks ever at J2 Nationals, winning two championships, taking a bronze, becoming the first ever to repeat as a champion. It was great redemption for all those long days working together and those long weeks on the road. He just completed a huge step towards making the US Ski Team and we were both relieved. I hate wind on speed days. Once Bonnie was in the start at the Sun Cup Super G and a gust nearly blew her back intot he start shack -- game over! That's the problem... wind creates an uneven playing field. The wind was pretty significant today. Some gusts at the top of the course were easily above 25 MPH. But the wind was pretty steady between the gusts so I have no idea the aggregate effect on the race. Fortunately, today's race was simply a FIS race, not the National Championship. Yesterday I did a pretty detailed post-race analysis of Scott's ski bases, trying to determine how much wax was left and where. Although the snow is warm and moist, the surface is hard at the points where most pressure is exerted on the ski. I found the inside edges of the base "dryer" especially towards the tip and tail. I'm assuming those areas are under the most pressure while turning and the wax is stripped off quicker. Given it was forecast to be 4 degrees colder today, I used a different strategy. I waxed harder under the base and at the inside edges. I still used a warmer wax for the rest of the ski. At the start line I also used a harder application the first 1/2" from the inside edge, then a warmer application over the rest of the ski. Scott rarely comments about his skis, but he told me they felt "slick." There was also a detailed post-race analysis of Scott's skiing, given his difficulties on the course yesterday. He already knew what to fix, I just had him explain it to me during inspection. All the fixes seemed to work as he won the downhill by 1.3 seconds, a huge margin in speed racing. He also posted the fastest time through the traps at 82 MPH. So it was a good day and we'll try to take this into tomorrow's championship race. Today was the required downhill training day. The track hardened sufficiently this week to provide a safe and fast race. Add sunshine and great visibility, and this was a great day. From a competitive standpoint, the hill leaves something to be desired. The upper 2/3 is steep enough and has variable terrain, but the final 20 seconds of the course is flat and unchallenging. There also are no jumps whatsoever. From our perspective, this hill takes away some of the advantages that normally would accrue to an experienced downhiller. Scott was second in the training run by .15 seconds. He did, however, post the fastest speed through the traps (81 MPH). If he had finished and told me, "I had a perfect run." I'd be worried. Instead he slipped to a hip and hand on the fourth turn, taking him off-line for that section of the course. He skied great from there down. So tomorrow is a FIS downhill, followed by the National Championship downhill the following day. Scott is confident and looking forward to the race. Stick to the plan... that's what ourfriend Matt Kerr always says and that has been one of our menomics all season. Forgot that one today. A central part of the "plan" is always to ski the long line. That went out the window in the second run today. It was the Giant Slalom day. Scott was the low seed going in and nobody in the field had beaten him all year. But that doesn't matter in ski racing and certainly doesn't matter in a championship race. The first run he cut a little too close to a gate and shinned it, destroying the gate and bucking himself sideways. Notwithstanding he finished in 3rd, just .12 off the lead. He was really focused and determined the second run, but probably tried too hard. He broke the patterning he's been using this year and pinched the line all the way down. Even with that he was running fast and in good shape until five gates from the bottom when he looped low and lost all of his speed. The end result was a Bronze medal. Perspective -- it's a Bronze medal at the National championships. Reality -- it should have been Gold. He's pretty disappointed with himself. Tomorrow is the Downhill training day (a non-scored race on the exact DH course they'll race). After that he has two downhills, the second one being the National Championship event. Scott loves Downhill, so no matter what happens this will be a fun ending to the week. Things are looking up. In the past two days the snow has setup and is getting really hard. Add to that a forecast including five sunny days, and we're ready to rock. Today was the Men's and Women's Super G competition. The policy here is that there is no free skiing allowed on speed skis. This policy was imposed after the death of a racer last year. This posed a real problem, given that the transition from Slalom to speed isn't that simple. This morning they allowed warm-up runs for one hour on the lower part of the race venue. Slow lifts converted that to just two practice runs. Scott and I made good use of the opportunity, testing various waxes. Scott's Super G race skis were bent at Aspen, so we've been scrambling to get his trainers up to speed. Based on our tests, we decided to use an experimental wax with a new overlay not yet in the Podium product line. While Scott inspected the course, I prepped his skis. 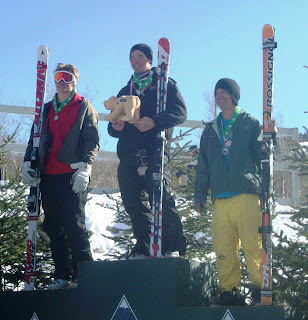 To get to the point, Scott won the Super G, becoming the first athlete ever to defend a national title at J2 Nationals. This was not without adventure. He charged hard from the start and was still skating after the second gate when he got hung-up on his inside edge and tipped over. He caught himself with his hand and quickly pushed himself back up, having only lost a little time. The rest of the run was great and the skis ran very well. So now the train is back on track. Tomorrow the Men have Giant Slalom. After that its three days of downhill. Day one at J2 Nationals started great. Scott was "cookin" during warm-ups and his head was in the right place. He felt it and I truly believed a slalom win was in the cards today. Unfortunately, he straddled a gate the first run and hiked a l-o-n-g way. He was 60th going into the final run. Scott was disappointed, but he's grown a lot mentally in the past two years. After a brief rest, he went out to warm-up for the next run. His question to me before the second run was, "Do you think I can win it?" I told him "No, but you can have fun trying. Impress me." And so he did. I am a USSA Alpine Racing Coach, with 15 years of experience. I am the father of four, and coach my youngest son, Scott Snow. I coached alpine Ski racers in the 1980's at Black Rapids, Alaska, then stopped coaching until Scott and Bonnie came along. I've been the director of the Independence Racing Team since its creation in 1998. I’m fortunate to live in the beautiful Sandpoint, ID area with my wife, Joy; daughter Bonnie (when she's home from MSU); son, Scott and our three cats.